The auto attendant is an important part of call control for any business. The auto attendant will answer calls and allow you to setup call routing to different users. If you would like help setting up your auto attendant, please give our customer service team a call. How do I forward all of my calls? From the DMR Communications Com Portal, select the Call Manager tab, then forwarding. Check the Forward calls immediately and put a phone number into the Forward calls to field. You do not need to enter a 1 in front of the number. 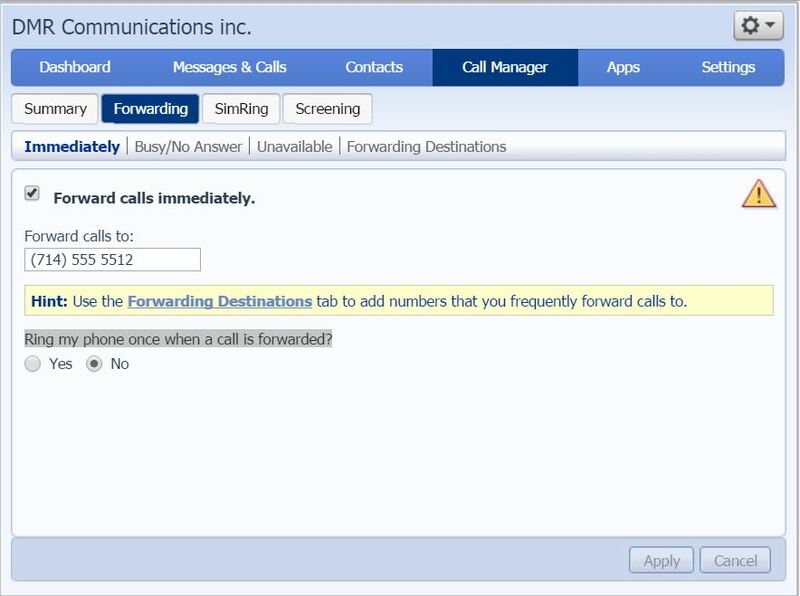 If you wish to have your phone at work ring one time click yes “Ring my phone once when a call is forwarded?” button. What is an off net or over the top, or third party? All three are the same, basically it means that your voice provider does not have control of Quality of Service (QoS). If you have static, choppy voice, dropped calls or any other issues your phone provider will blame your ISP. There is no accountability for your voice calls. DMR provides end to end network control from customer premise back to the phone switched network. This allows DMR to have total control of the call path and allows us to ensure high quality voice communications without interruptions. DMR has our own customer service team. Live operators are almost impossible to talk to, not with DMR. We do not have an auto attendant, or hide behind email and chat. Call our main line (866)404-2988 to talk to someone who can help. Using a Cisco SPA phone to setup a 3 way call. While in a call push the “conf” soft key. Dial the number of the person you wish to bring into the conference. When they answer the phone push the “conf” button again. When you are done with the conference there are 2 options on how to end. First you can push the “endCall” soft key to end the call. Second you can push the “join” soft key. This will connect the other two parties together and exit you from the call. Call parking allows you to put a call on hold on one phone then pick it up on another phone. The advantage of doing this is that you do not have to do a call transfer, or know the number of the other ip phone you will pick the call up from. While in a call push the soft key that says park. If it is not visible you may need to push the right arrow on the toggle button. Listen for what orbit it will be parked on. Push the xferLX soft key to complete the transfer. On any ip phone scroll to the soft key that says pickup and the number of the orbit that the call is parked on. First think to do is to confirm that DND or do not disturb is not turned on. Look on your screen and check if it says “Do Not Disturb” Also look for a soft key that says -dnd. If the – sign is there then do not disturb is turned on and your phone will not ring. Click on the -dnd button to turn of do not disturb. While in a call push the CONFERENCE key. Dial the number of the person you wish to bring into the conference. When they answer the phone push the conference button again. First you can push the “End Call” soft key to end the call. If you only want to disconnect one person you can select their number using the arrow keys and push the “Drop Call” soft key.